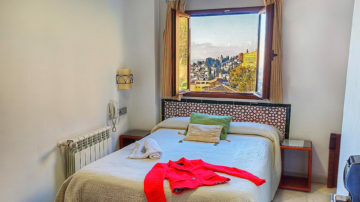 Hotel Arabeluj en Granada, cerca de la Alhambra. Espectaculares vistas. 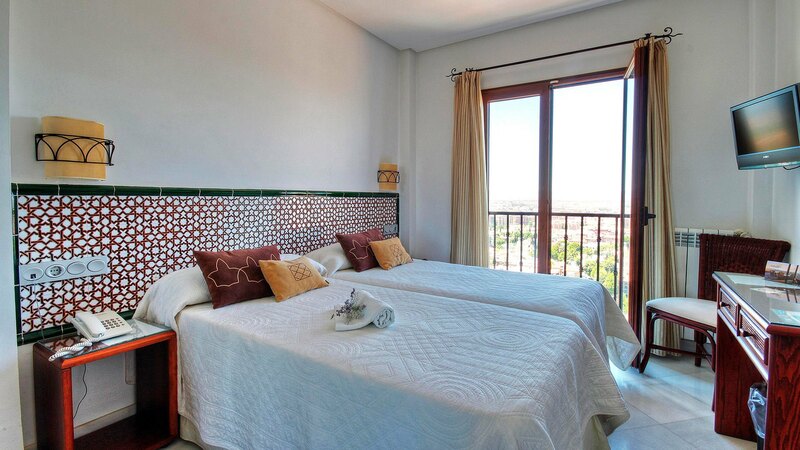 It offers spectacular panoramic views of the entire city. 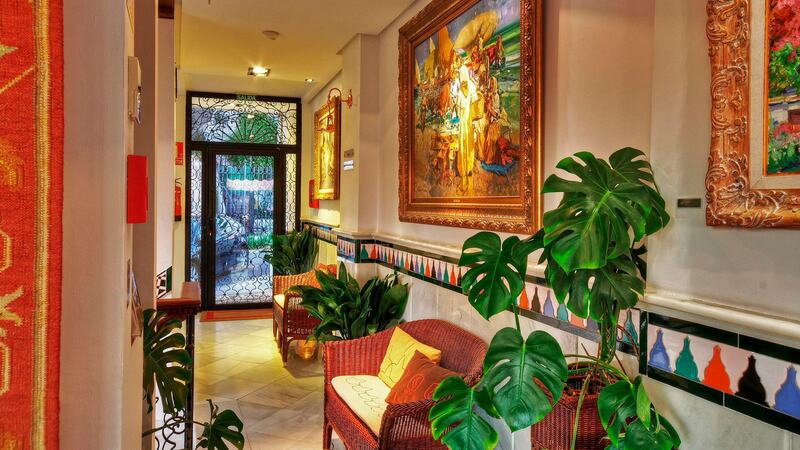 Discover this charming hotel in Granada. 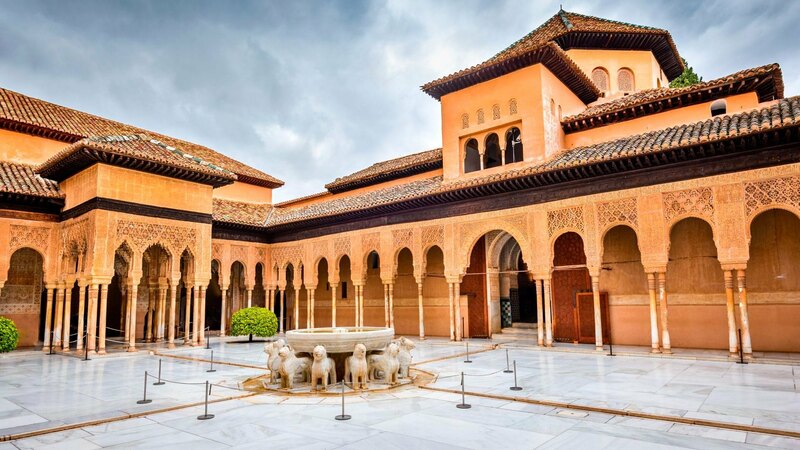 Located next to the Alhambra. 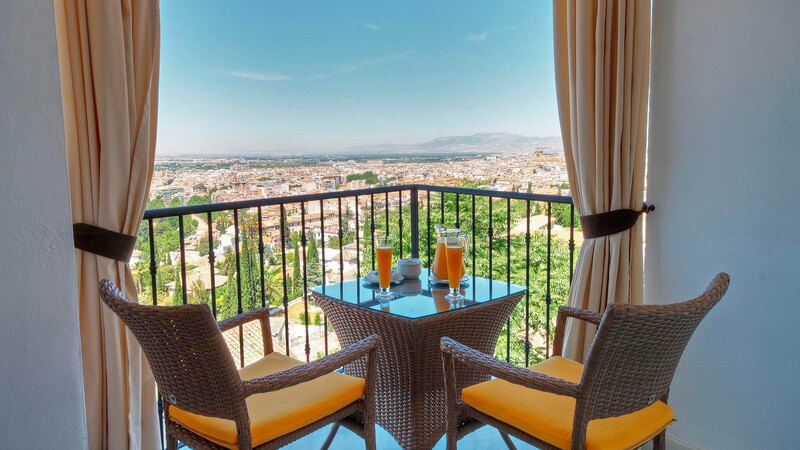 It is a hotel veranda with a splendid panoramic view from Granada city each and every one of its rooms. 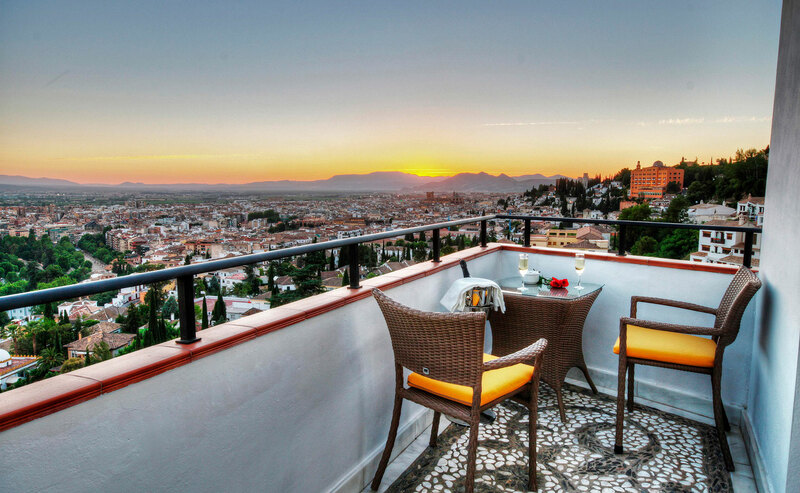 Visitors can feel the peace offered by the environment and appreciate from this viewpoint balcony where you will see a spectacular view of the city, on top of Realejo, adjacent to both the city and the Alhambra neighborhood. 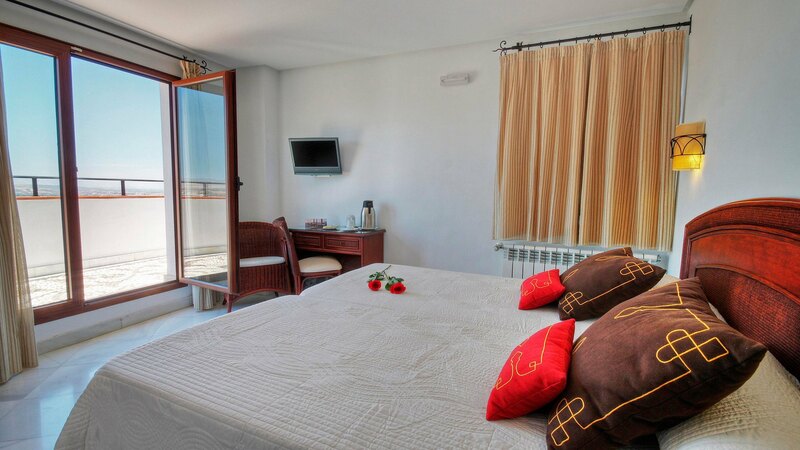 From its viewpoint terrace we sensibilizaremos with fantastic sunrises and sunsets a treat for the senses. 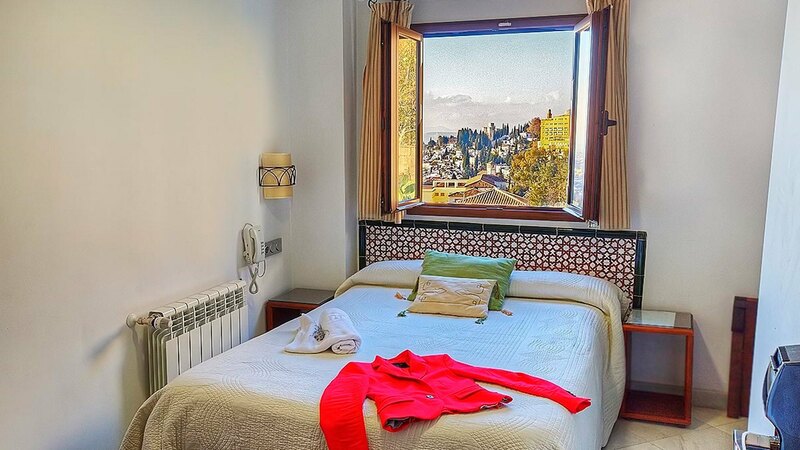 Its location is ideal because of its proximity to the majestic monument of the Alhambra just 5 minutes walk, and very well connected to walk to the city center and enjoy the cuisine and customs, it is truly a hotel in Granada with charm. It consists of cozy rooms that are "Balcony of Granada" Andalusian style. 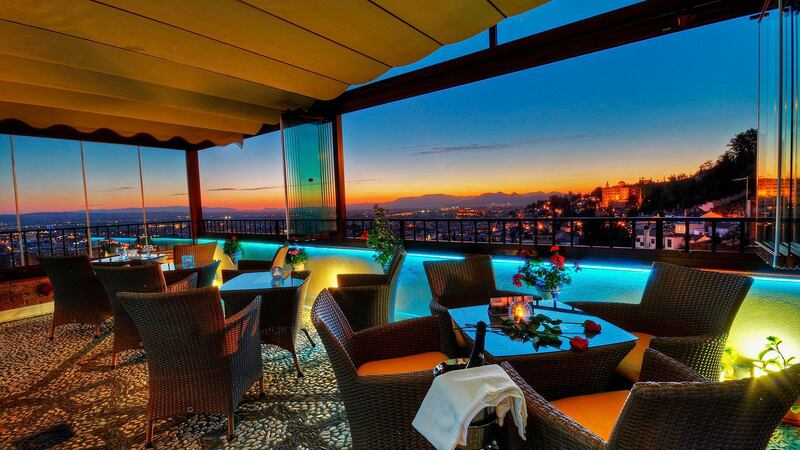 Spectacular terrace where you can taste different menus, dinners or events. Exceptional 10-minute walk from the Alhambra and 10 minutes from downtown situation. 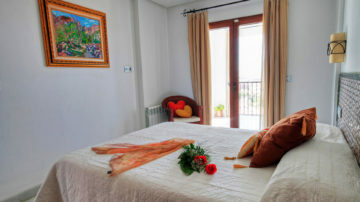 Get 7% discount when booking directly on our website. Hotel built in 2008 has a total of 12 rooms and suites spread over 3 floors. 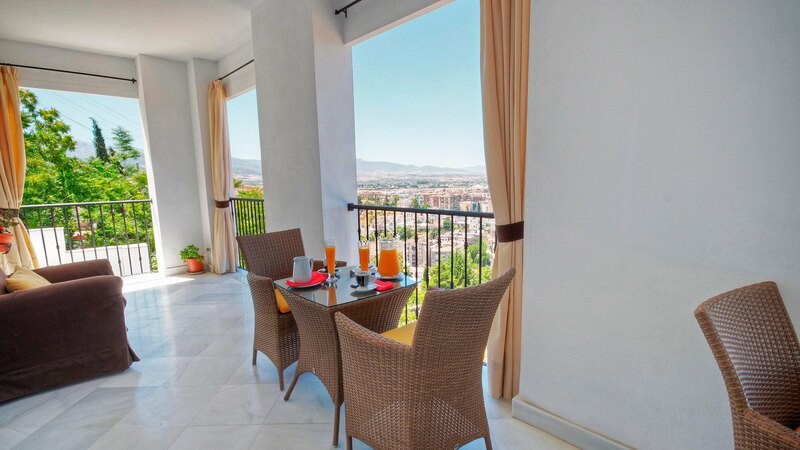 Located in a privileged position offers a magnificent panoramic view of the city of Granada from its terrace. 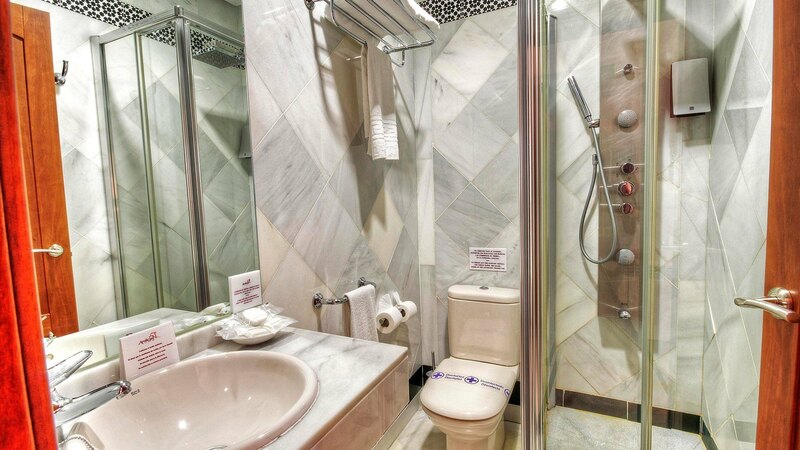 Fully air-conditioned throughout and features a lobby with a safe and cloakroom, and lift access, a TV lounge, cafe, bar, WI-FI Internet access, room service, laundry, tourist information and ticket sales. 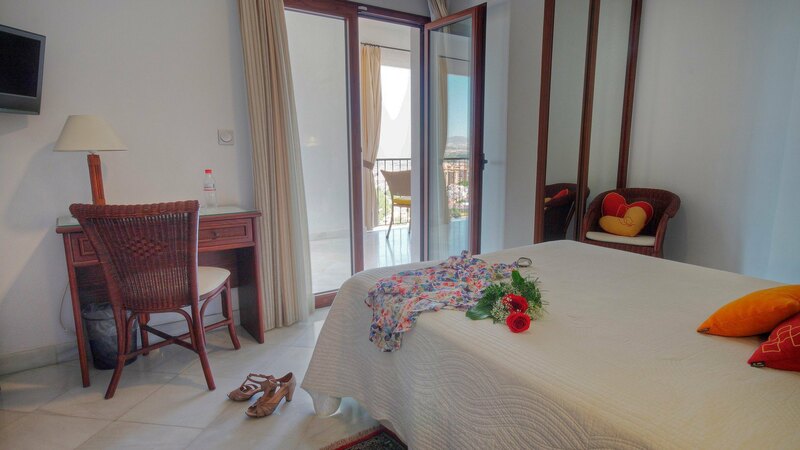 Three coquettish superior double rooms with private terrace some highly recommended to surprise your partner. 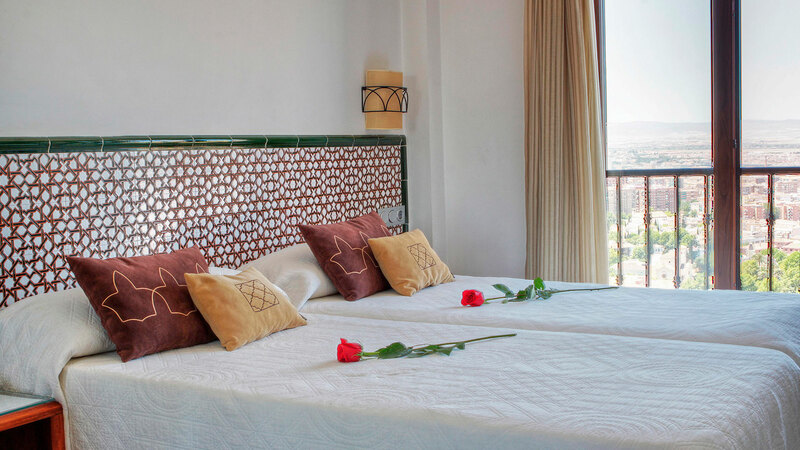 Spectacular rooms with private terraces, panoramic views and beautiful sunsets, highly recommended if you want to surprise your partner. 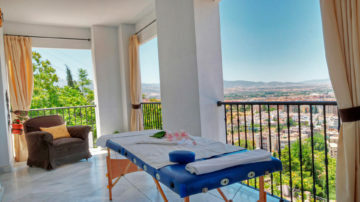 Granada Hotel Arabeluj is located on the slope of the Alhambra, 35 km from Sierra Nevada and 65 km from the Costa Tropical. It features a terrace with stunning views of Granada and the Sierra Nevada. 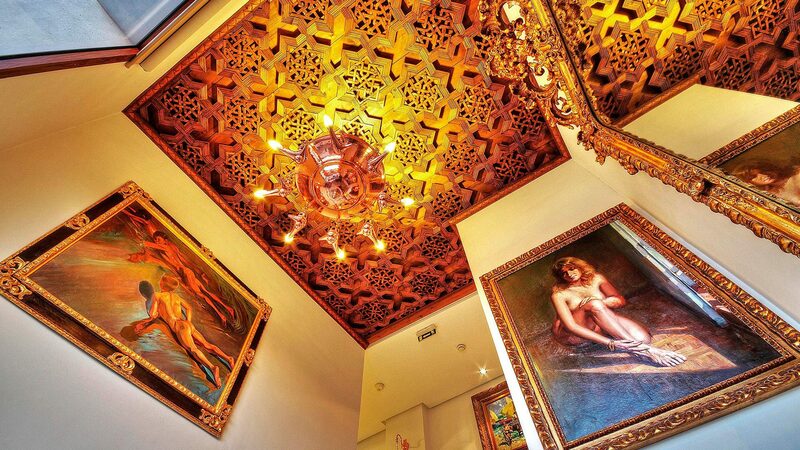 It is a 10-minute walk from the Alhambra and 10 minutes walk from the center. 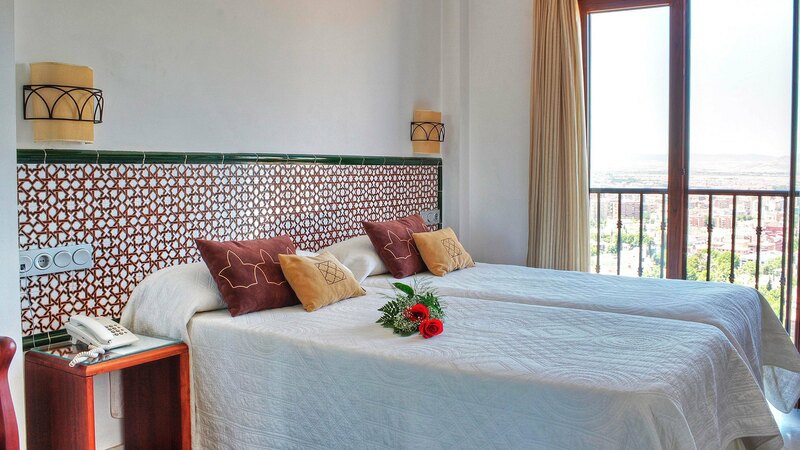 This charming hotel has traditional Moorish-style decor with ornamental elements of Christian and Moorish style. Rooms include air conditioning, central heating, flat-screen TVs, free WiFi and a private bathroom. 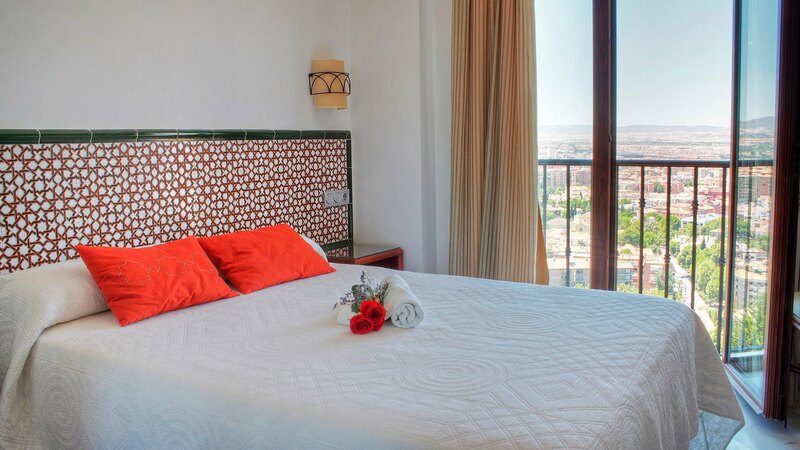 The hotel also offers a tour desk and ticket to the Alhambra. 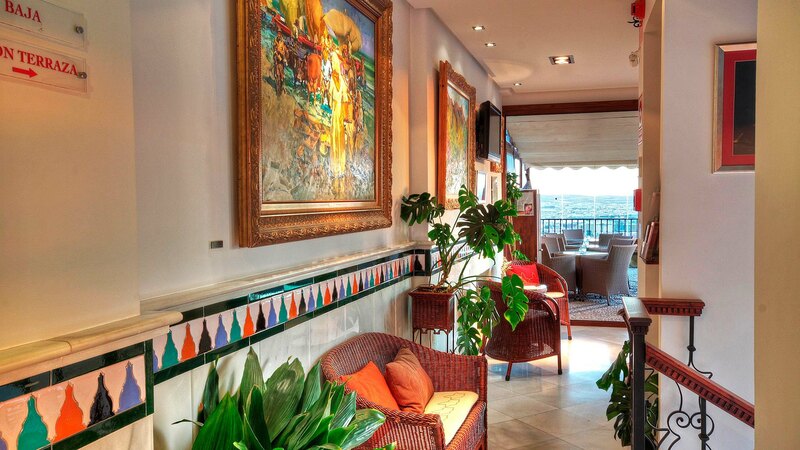 In addition a café with spectacular views of Granada bar serving breakfast, menus, snacks and dinner daily. 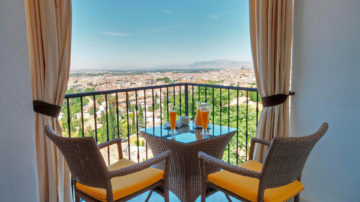 You can enjoy a variety of options for breakfast watching the sunrise, taste different menus, romantic dinners or meetings, while admiring magnificent views of Granada. Free Breakfast Boabdil : if you book directly with the hotel. Discount not combinable with other offers. Price: 71.50 € / person / VAT included. Price: 99 € / person / VAT included. 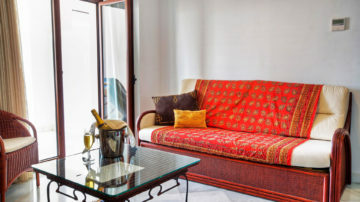 Night Superior Double Room with Private Terrace + Bottle of Cava + 1 hour massage to share between two + Romantic Menu at the Mirador Arabeluj Terrace. 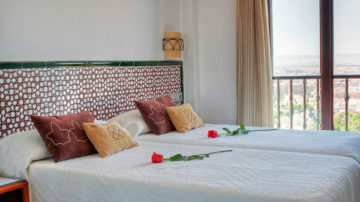 Night Superior Double Room with Private Terrace + Breakfast Mirador Arabeluj Arabeluj in Terrace + Arab Baths. Price: 79 € / person / VAT included. Price: 97 € / person / VAT included. Price: 45 € / person / VAT included. Price: 50 € / person / VAT included. Price: 85 € / person / VAT included. Price: 89 € / person / VAT included. 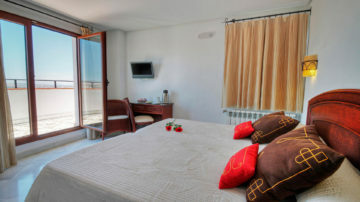 Price: 71.50 euros per person / VAT included. ** Menu includes: first and second course, a drink and a dessert per person. ** Dinner includes: Iberian board, main course, drink and dessert. ** The pack with Romantic Dinner menu and requires at least one day of confirmation. Price: 60 euros / person / VAT included. 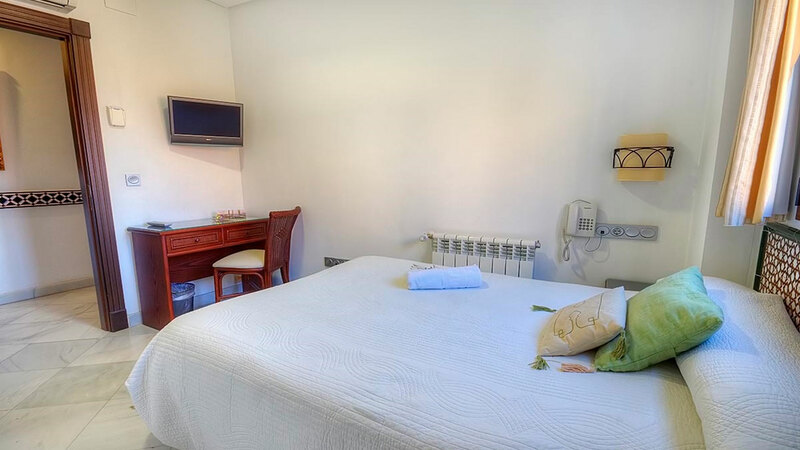 Non-refundable rate: 114 euros / night, VAT included, accommodation only. IBERIAN: Toasts with ham + coffee or tea. .................................................................. ..... 3.5 €. AMERICAN: Toast with peanut butter + American coffee or tea + salchichón ......... 4 €. BIKINI: Toast with ham and cheese + orange juice ....... ............................................. 5 €. FRENCH: Croissant + tea + coffee or banana slices ..................................................................... 4 €. ENGLISH: Tea or coffee + toast + beans + sausage + juice ...................................................... .... 6 €. ANDALUSIA: Toasts (tomato / oil / butter) + coffee or tea ....................................... .................. 3 €. Juice ....................................................................................................................................... .. .............. 2 €. Chocolate milkshake………………………………………………………………………………………………........... ....... 2 €. Donut .................................................................................................................................... ..... ............. 1.5 €. .................................................................................................................................... muffin ..... ............ 1.5 €. Apple pie ......... ..................................................................................................................... ......... 2 €. We really liked the treatment very friendly staff at all times. Maybe the great views from the room. Fantastic terrace overlooking the entire city, like the rooms. very quiet and recommendable Hotel. 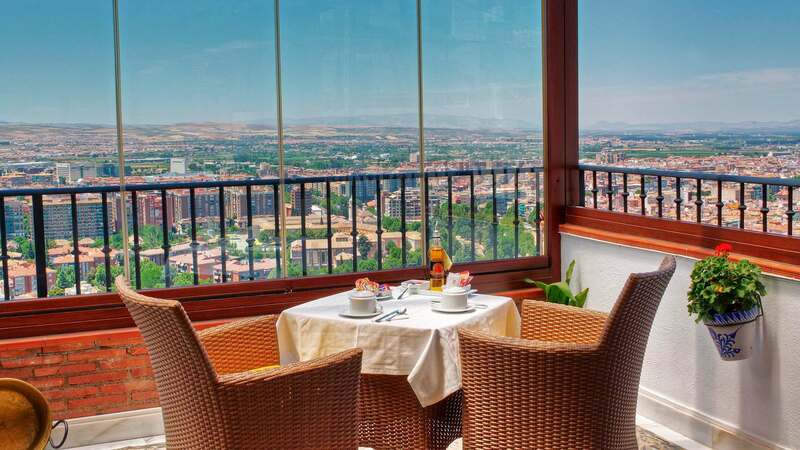 The hotel is modern and charming with excellent views from the viewpoint terrace. Worth staying.